Click on the video to watch a Q&A with Strongwater Farm in Tewksbury, MA, who hosted a ride with ACTHA. PATH Intl. center staff, volunteers, participants and their families know better than anyone the power of the horse to change lives. You see it every day. It has long been our desire to further the awareness of equine-assisted activities and therapies to the public at large and to promote the knowledge, professionalism and high standards of each PATH Intl. Center to their local communities. We have an opportunity to do just that, and possibly help bring in funds for your center. 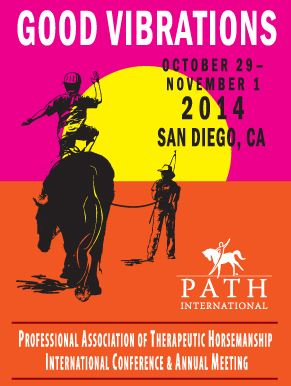 ACTHA (American Competitive Trail Horse Association) has invited PATH Intl. Centers to become ride hosts. ACTHA has coined March as "The Shamrock PATH" with a goal of 1,000 Obstacle Challenge trail rides around the country during March and specifically March 14-16, 2014. Some rides will still be taking place in April. The event requires only an arena or some open land, and two or three people from your center to manage the event. By becoming a ride host, your center would attract trail riders in your area to come for a fun day of casual competition. You can gain local exposure while earning funds for your center and PATH Intl., as your center will retain a portion of entry fees. ACTHA has already been contacting some centers directly, but if you would like to learn more, visit ACTHA at www.actha.us/path to see how this works and how your center could benefit, or call Robin Tilghman, ACTHA's PATH Intl. events manager, at (434) 989-1437. Reminder: As a data-driven association, we need to gather information about our members. Every month we will ask you to answer a simple one-question survey that will assist us in implementing the PATH Intl. strategic plan. Thank you for your participation! Does your center offer summer camps to children on the autism spectrum? Autism Speaks has a scholarship program for centers to apply for funding for these camps. The deadline is March 10 and all information can be found on the Autism Speaks website. Any centers that succeed in receiving funding, please let Megan Ferry at PATH Intl. know so she can track this information. A Gypsy Horse for Your Center? Over the next two years LexLin Gypsy Ranch's mission is to donate 30 registered Gypsy Horses through the Gypsy Gift program while simultaneously finding eligible sponsors who will train them for two to three years in preparation for future careers at PATH Intl. Centers. Nominate your favorite PATH Intl. Center to win a Gypsy horse! Visit GypsyGift.com for details and to submit a nomination today! Thank you to all of you who donated to PATH Intl. in 2013! We received 571 of your generous donations last year. All 2013 thank you letters (your tax receipt) have been mailed out. If you need a tax receipt or have any questions about donating to PATH Intl., please email Megan Ferry or call her at 303-452-1212 x 107. Thank you for your generosity! Members of PATH Intl. receive a 10% discount on all membership plans for Equestrian Professional.com, the Horse Business Site. In order to take advantage of these discounts, click here and you will be automatically directed to a sign up page that reflects your special discount! As horse professionals, they know the business of horses can be incredibly challenging. So how do you balance your love for horses and your participants with the hundreds of details required to start, run, and grow a successful business? Imagine a place where you can get personal advice from experienced professionals and experts who truly understand the horse business, enjoy VIP access to a unique support system designed specifically for horse professionals. It doesn't matter if you're just starting out, or you're a well-established center administrator with years of experience. A membership at EquestrianProfessional.com will show you how to attract the best customers, make more money, retain top talent, inspire loyal staff, stay on track to achieve your center's goals, and most importantly keep you loving the business of horses...100% Guaranteed. And Don't Forget These Newly Announced Benefits! Congratulations to Mr. Wise Guy, or "Wiser," the 2013 PATH Intl. Equine of the Year, who was featured in the winter issue of Modern Arabian Horse, the official publication of the Arabian horse industry. The article "Our Heroes Are Horses" features a few of the letters of recommendation Wiser received for his nomination. Wiser makes his home at Wings and Hooves Therapeutic Riding Center in East Kingston, NH. Your PATH Intl. Center has decided it's time to adopt a new equine-assisted activities and therapies (EAAT) horse--what should you do next? Click here to read suggestions and considerations. Please direct correspondence about this newsletter to PATH Intl. eNews coordinator. PATH Intl. eNews is a benefit of Professional Association of Therapeutic Horsemanship International membership. No portion of this publication may be reproduced by any mechanical, photographic, scanned or electronic process without written permission from PATH Intl. PATH Intl. reserves the right to reject, accept and edit submitted material. PATH Intl. eNews is intended as an information exchange and an opportunity for communication for members in the field of equine assisted activities. The opinions, practices or products presented in PATH Intl. eNews do not necessarily reflect PATH Intl. policy, imply PATH Intl. endorsement or comply with PATH Intl. standards..